Now that we’ve chosen a niche and completed keyword research, the next step is to focus on geting the site live and then we can start adding content and building our website’s foundation. There are many different ways to set up a niche website, and the process has many same steps as setting up micro sites or any other normal WordPress site but with the ultimate goal of generating income in mind I will keep the site as simple as possible while focusing on improving user experience and conversion rate to maximize the income potential. In this article, I will be sharing with you the entire process and checklist I used to quickly set up a website that not only encourages reader’s engagements (user-friendly) but also rank high on Google (SEO-friendly). Let’s get started! For those of you who may not know, WordPress is the leading content management system that over 22% websites on the internet is using it because of its flexibility and ease of use along with a large WordPress community of users and developers. I have personally been using WordPress for over 5 years and all of my websites are built with WordPress. So this case study website is not an exception. For more information about WordPress, visit WordPress.org. Please note that there are two kinds of website using WordPress : self-hosted and hosted. Hosted websites run on WordPress.com where you can set up your blog for free. You don’t have to pay anything and you can have your blog up and running in minutes. However, your website will have some limitations such as lack of ability to choose themes and plugins and the site’s url will always have the word “wordpress” in it, such as cloudlivingjourneu.wordpress.com, which decrease its authority in the search engines. Hosted wordpress websites are only suitable with personal or non-profit blog. Self-hosted websites are much better solution when it comes to setting up a real online business. Your website will run on your own hosting and unique domain name (like cloudliving.com). This will give you totally full control over your website and will significantly increase the trust on both user and Google’s eyes. I recommend using a premium hosting service like Hostgator and affordable domain name provider like Namecheap/Godaddy to get cheap hosting and domain name for our sites. Domain name is important, it’s like your home address on the web. Before setting up the site, we have to pick a domain name first. For this case study, my chosen keyword is “how to clear acne” so I have 2 options to go with now: brand domain or Keyword domain. Branded Domain is something like “ClearAcneDoctor.Com” or “AcneSamurai.net ” or “AcneTiger.org”. In short, Brand domain doesn’t include your keyword, is short and easy to remember. It’s great to build an authority site with massive brand. Two domain name registrars I recommend are: Godaddy and Namecheap. I have used several hosting providers but eventually I found Hostgator to be the cheapest and most reliable hosting company. I have been using Hostgator for many years and now all of my websites are hosted on their servers. I am completely satisfied with them and never got any trouble that couldn’t be solved within minutes with their excellent customer support through email/chat/phone. I don’t want to look like am aggressive salesman here by talking too much about them but they’re simply the best solution out there. You can get your website up and running in minutes with a hosting package for as low as $3. If you don’t already have your hosting, you can grab a hosting package with Hostgator (using the coupon code CLOUDLIVINGJOURNEY to save 25%). Also, if you’re not sure how to set it up, shoot me an email and I will be more than happy to help you. Forget about anything that is fancy and rainbow-colored. An ideal theme for niche websites is a simple one with a lot of white spaces and uses as few images as possible. Why? Just revise the goal of a niche website. We’re going to build a website that both produces the reader with value and encourage them to click on the ads/banner to the product landing page. Anything that doesn’t serve this goal and disturb our readers should be eliminated. With that mindset, I will be using Genesis Framework and Prose Child Theme for my niche site. This theme looks perfect! Another paid option which was perfectly developed for niche sites is the Niche Website Theme which was created by 2 experts at building niche website Spencer Haws and Chris Guthrie. It comes with many awesome features but I don’t use it because I personally think it’s ugly (sorry Spencer) despite the fact that that theme works very well and the conversion rate would be very high. I will try it someday! SimpleFolio: A Free Clean Portfolio WordPress Theme. WordPress SEO by Yoast: The most important plugin to help you make your site friendly with SEO easier. MaxBlog Press Ninja Affiliate: To manage, track, cloak and shorten unlimited number of affiliate links from one central location. This is a paid plugin. You can get a 14-day trial or use Pretty Link as a free solution. Digg Digg: This plugin allows people to share your content on a variety of social media sites like Twitter, Facebook, Google +1, etc. W3 Total Cache: This plugin improves your website’s performance and page speed. Easy WP SEO: Just push a button, and Easy WP SEO analyzes your post, page, or custom post type for 23 proven on-page SEO factors. It displays an SEO and keyword density score that reveals how well your content is optimized for the search engines, and provides you with a detailed checklist of suggested SEO tweaks. Create a new page and go to Settings >> Reading and set is as front page. Create a “Contact” page using Contact Form 7 or Jetpack. Install Google Analytics or Clicky to track traffic stats. So that’s it! That’s how I set up my niche website with Wordpres at howtoclearacneguide.com. If you head over to the site right now, you will see a static homepage with basic onpage SEO and Mr.Bean’s picture 🙂 I’ll tell you why in the next article. 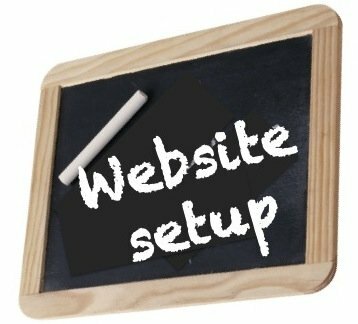 Do you have any questions regarding this subject on how to set up a website with wordpress? If so, don’t hesitate to ask me by leaving a comment. I’d be happy to answer every question of you guy :). Don’t forget to subscribe to keep yourself updated with my other updates of this exciting niche website project. All the best for your public niche site project. I loved your contents. Just want to give an input if that’s of any help. Your site’s navigation needs improvement I think. I fall here from nichepursuits, liked first article but that it’s really hard to find other posts. I know you have next post + previous post section at the bottom but that’s not visible to for lazy pigs like me. I recommend you something more in sidebar. Instead of one tab, you can add 3 tabs in sidebar, just like Pat’s blog. It would really increase your page views I feel. I am also niche site creator like you so thought of giving what I felt. You are best decision maker though. Again, best of luck brother. I am really impressed with how cleanly all your sites are set up, every link is clearly tracked and your content is so logically laid out. You definitely have a good thing going on! Thanks for stopping by! I’m so happy to have you here. whats the difference between using the all in one seo pack vs seo by yoast? do your dumbbell website use genesis and prose child theme? And what is plugin you use to make your side bar stick? I use Lifestyle child theme. I really appreaciate if you will teach us ‘how to configure wordpress seo by Yoast’. This plugin have many features, thats why confused us. Personally I have google for this plugin setting but didnt find satisfactory site. Anyway your writing style is a great, if you will make tutorial for this plugin we will learn alot from you. Do you still recommend the plugins above? Are there any others you have found over time to work well – specifically what are you using for privacy plugin and amazon affiliate plugin (if you are using one)? You’re a beast Tung! 😛 In case anybody needs this that doesn’t have time/skills for HTML & CSS, there is a plugin called Universal Sta Rating that has this functionality. Nice posy man…and i am actually trying to do something like this for one of my sites and monetize with Amazon. Quick question. the review table in your site showing the different dumbells and their properties…how did you do it? 1.) How to evaluate competition with you tube videos, articles of wikihow, enzine, how stuff works and magazines with your keyword. 2.) If none of the websites have EMD is it possible to rank higher as compared to article directories and you tube videos. I’m still very impressed with how clean your website is. I noticed in the blog articles you have something at the bottom saying “Filed Under “. Are you using a plugin for this and the “See More In This Category”? I’m guessing the See More is from Yet Another Relate Post but not sure about the “filed under” with a nice little folder next to it. That’s a nice and detailed instruction. I recently migrated my blog from blogger to WordPress. Can you tell me how to get the email subscription widget you have? Thank you in advance. So far the only guide I knew about 😀 just subscribed Cloudliving! Thanks again for every post in here, really appreciate for your help. i have a question for “easy WP Plugin” that you recommend. i can’t found that plugin at my admin dashboard. i already install seo by yoast, whether this plugin (easily WP SEO) is still needed to complete or just simply only install SEO-by-Yoast Plugin? The plugin is discontinued. I’m not using it anymore also.